1997 marked John Foxx's triumphant return to the music scene, following a quiet period in which he focussed on other artistic projects and lecturing on graphic design. Cathedral Oceans and Shifting City were Foxx's first new solo releases since 1985's In Mysterious Ways. However style-wise, Shifting City saw Foxx and Gordon heading back to the minimal electronic style of Metamatic. Beatles style harmonies and melodies represent Foxx’s continued fascination with psychedelia, whilst metallic drum loops and minimal arrangements showcase Louis Gordon’s energy and influence. Shifting City tends to sound quiet and metallic, but that doesn’t change the fact that this album contains several classic John Foxx songs. The first album to be co-written and produced with Louis Gordon, Shifting City is a high-energy album, with driving beats and hard, cold electronics. Tracks such as "Crash" and "Shadow Man" recall the sparse electronic arrangements of “20th Century” or “Burning Car”, while others such as "Through My Sleeping", “The Noise”, "Shifting City" and "An Ocean We Can Breathe" are richer and more melodic with Foxx's Beatles influence shining through the harmonic vocals. The bluesy “Forgotten Years” and “Everyone” show a very different side to Foxx’s writing and vocals, adding an extra layer of diversity to the album. Some of the ideas which started off as part of the Nation 12 project finally saw completion for this album. One of these tracks was “Through My Sleeping” (originally titled “Leaving”) which was also demoed for the abandoned “Blitz” project in 1993. The final version of “Through My Sleeping” is one of the album’s real highlights, and was reworked yet again with several other album tracks for the Subterranean Omnidelic Exotour CDs. strangely appropriate for the themes and sounds running through this album. Having grown up in Lancashire and Manchester, Foxx and Gordon were only too familiar with the image of factories and industry, and built the music around these themes as well as Foxx’s Metamatic-era vision of a constantly evolving city environment. 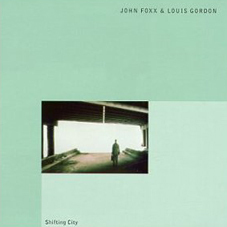 From 1950s style blues with an electronic edge to psychedelia inspired pieces, Shifting City picks up from where Foxx left off in 1980, planting him firmly back where he belonged and most importantly, heralded the start of what would be a long and highly creative musical partnership. The double-disc remaster was finally issued in October 2009, finally putting this long-deleted album back on the shelves, and filling a significant gap in many fans CD collections. The sound on Shifting City has been vastly improved – the sparse, metallic, often hollow sound of the original recording has been replaced by a richer, much heavier and fuller sound. Various new synth parts have been added where necessary, and sounds previously mixed too far back, are now given the prominence they needed, resulting in a revitalised, almost new sounding album. The addition of a very different, early version of "Shadow Man" also provides a perfect link to The Pleasures of Electricity.